Figures released today by the Jubilee Debt Campaign, based on IMF and World Bank databases, show that developing country debt payments increased by 60% between 2014 and 2017. They are now at the highest level since 2004. 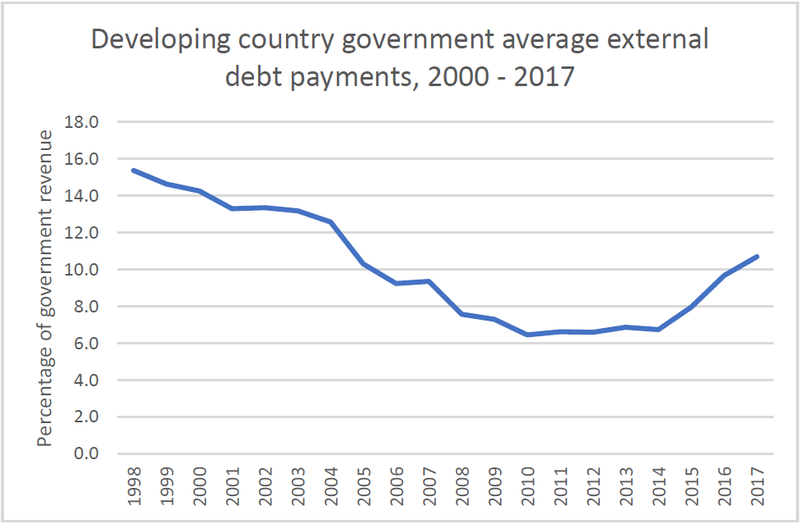 The new analysis from Jubilee Debt Campaign shows that average government external debt payments across the 126 developing countries for which data is available have increased from 6.7% of government revenue in 2014 to 10.7% of government revenue in 2017, an increase of 60%. This is the highest level since 2004, when such payments were 12.6% of government revenue (see graph below). This rapid increase comes after a lending boom due to global interest rates being low. External loans to developing country governments almost doubled from $200 billion per year in 2008 to $390 billion in 2014. They have since fallen back to between $300-350 billion per year from 2015-2017, but this is still well above levels seen prior to the global financial crisis. The fall in global commodity prices in mid-2014 has reduced the income of many governments which are reliant on commodity exports for earnings. They also caused exchange rates to fall against the US dollar, which increases the relative size of debt payments as external debts tend to be owed in dollars. 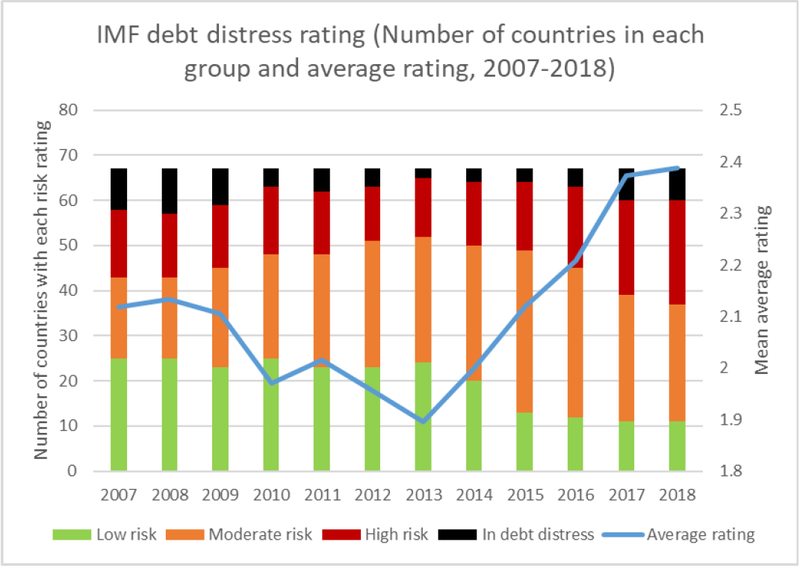 Developing country external debt payments fell between 2000 and 2010 because of rising prices of commodity exports and the Heavily Indebted Poor Countries Initiative, which cancelled almost $130 billion of debts owed to governments and multilateral institutions for 36 low and lower middle-income countries. The IMF say that of 67 impoverished countries they assess, 30 are now in debt distress or at high risk of being so. This has doubled from 15 in 2013 (see graph below). The full figures for all 126 countries are available here. The average figure is a mean unweighted average. The median unweighted average has increased by 75% between 2014 and 2017, from 4.9% of government revenue to 7.9%, indicating that the mean increase is a general trend rather than due to particular outliers. Where they are available, the figures for government external debt payments as a proportion of revenue come from IMF and World Bank Debt Sustainability Assessments conducted for individual countries. In total these cover 60 countries. For the other 65 countries, figures for government external debt payments are from the World Bank’s International Debt Statistics 2018 and figures for government revenue are calculated from the IMF’s World Economic Outlook Database, October 2017. The IMF’s commodity price index fell from 185 in June 2014 to a low of 83 in January 2016. It has since increased to 106 as of June 2017 (the most recent date available from the IMF), but this is still 42% below levels in mid-2014. Annual external loans disbursed to low and middle-income country governments have increased from $202 billion in 2008 to $390 billion in 2014. For 2015-2017, disbursements have been $332 billion, $347 billion and $332 billion. Source: World Bank World Development Indicators database.